Apartheid in South Africa was a great injustice and a violation of freedoms and liberties of black South Africans. I have little or no admiration or respect for anyone who opposed action against the racist regime. Britain's first female Prime Minister, Margaret Thatcher, passed away on 8 April 2013 at the age of 87 after suffering a stroke. Flags in Britain fly at half staff in honor of the Baroness and tributes have been flowing in. Many portray her in a positive light. Little is said about her controversial apartheid policies that propped up a racist regime in Africa. Champion of freedom and liberty? British Prime Minister David Cameron described Thatcher as a "great Briton" who has a "well-earned place in history" and the "enduring respect" of the British people. According to David Cameron, Margaret Thatcher "saved" Britain. I agree with Prime Minister Cameron. Lady Thatcher was a great Briton. However, we must not lose sight of the fact that she put Britain's economic interests ahead of freedom and liberty by opposing sanctions and doing business with a racist regime that oppressed its people. She opposed a plan of action against apartheid and frustrated efforts by Commonwealth leaders to end apartheid. She opposed sanctions designed to pressure South Africa's apartheid regime to stop racial discrimination, release political prisoners and respect civil and political rights because she believed sanctions would negatively impact Britain's interests in the African country. Reacting to the death of Margaret Thatcher, US president Barack Obama said she was "one of the great champions of freedom and liberty". It is hard to agree with Obama's assessment of the former British prime minister. Champions of freedom and liberty do what is necessary to stop an injustice like apartheid. Margaret Thatcher linked Nelson Mandela, a towering symbol of freedom and liberty, to terrorism during the struggle against apartheid. Needless to say she was wrong. The ANC is South Africa's ruling political party as of the time of this writing and has governed post-apartheid South Africa since 1994. Mandela was repeatedly called a "terrorist" by Conservative Party MPs under the leadership of Margaret Thatcher. A Conservative MP once called the freedom fighter a "black terrorist". [Source] Others said Mandela should be shot. Like Thatcher, many Conservative MPs were hostile toward the ANC and its members. In 2009, David Cameron said Margaret Thatcher was wrong to link Nelson Mandela to terrorism, and apologised for Thatcher's apartheid policies. People held parties to celebrate the death of the Baroness in parts of the UK. In South Africa there were mixed responses to her death. 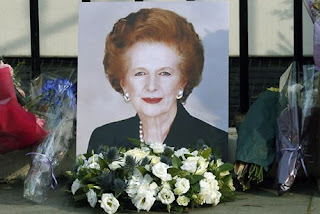 Dali Tambo, son of ANC's late president Oliver Tambo, said ANC ancestors will boycott Margaret Thatcher's arrival at the pearly gates (gateway to Heaven). While I disagree with Thatcher's apartheid policies, I condemn celebrations of her death. I admire Margaret Thatcher for the fact that she broke the glass ceiling and inspired women around the world. However, I would remember her as a Conservative hardliner who stood on the wrong side of history at a time when black South Africans were in desperate need of concerted international action to redress a grave injustice.